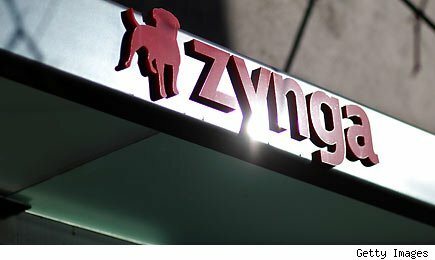 Zynga (ZNGA) is acquiring OMGPOP, the company best known for the Draw Something game that has gone viral on smartphones and Facebook in recent weeks. It's currently the top download on Apple's (AAPL) App Store in 84 different countries. The Pictionary clone is simple but addictive. A player chooses one of three words to draw out. If the other player guesses correctly, the two players advance to a new round with the second player doing the drawing. The two players go back and forth until the streak ends. Unlike most social games, where players are competing against one another, the two players are united in simply trying to beat their previous high scores. Zynga isn't disclosing how much it will be paying for OMGPOP, though TechCrunch is hearing that it could be as much as $210 million. That's a sweet payout for a company that was watching over dozens of mostly obscure games just a couple of months ago. Zynga is the undisputed champ of casual gaming. It's the company behind FarmVille, Words With Friends, and Scramble With Friends. Despite the newness of this space, Zynga commands a market cap of more than $10 billion. It only helps that when Facebook filed to go public a few weeks ago, the social networking giant revealed that Zynga was accounting for 12% of its revenue. Draw Something was growing more popular than any of Zynga's own individual games, so it made the logical decision to buy out its parent OMGPOP. Zynga isn't going to be able to buy every hot social or casual game, but this one was a no-brainer. The game has been downloaded 35 million times. There were a billion drawings created just last week. Zynga doesn't plan to change the name of the game from Draw Something to "Drawing With Friends" to stick to the naming trend of its board game knockoffs. However, the social gaming leader is already thinking of enhancements it can add to the game. David Ko -- Zynga's chief mobile officer -- mentioned during Wednesday's afternoon call that the game may implement a chat feature, though that seems like a disaster. It's bad enough that folks can cheat in the game by simply spelling out the word instead of drawing it. The last thing that the game needs is to give folks a text chat platform to make that flaw even larger. Zynga doesn't necessarily need the growth that OMGPOP will bring to the drawing table. Bookings in Zynga's first quarter as a public company rose 26% to $306.5 million. However, growth has been decelerating lately, so maybe it was time to beef up the company's organic growth with an outside developer. Can Zynga make Draw Something an even bigger phenomenon? Maybe. Zynga's games reach out to 48 million daily active users and 240 million monthly active users. Zynga won't be able to buy every hot app maker, but it may as well enjoy the ones that it's able to add to its growing portfolio. Longtime Motley Fool contributor Rick Munarriz does not own shares in any stocks in this article. The Motley Fool owns shares of Apple. Motley Fool newsletter services have recommended buying shares of Apple. Motley Fool newsletter services have recommended creating a bull call spread position in Apple.